The constellations best seen in October are Aquarius, Grus, Lacerta, Octans, Pegasus and Piscis Austrinus. Lacerta and Pegasus are located in the northern sky, while Aquarius, Piscis Austrinus, Grus and Octans lie in the southern celestial hemisphere. October is the best time of year to observe a number of deep sky objects located in these constellations. They include the Great Pegasus Cluster (M15), the spiral galaxy NGC 7331, Stephan’s Quintet, the Helix Nebula (NGC 7293), the Saturn Nebula (NGC 7009) and the Atoms for Peace Galaxy (NGC 7252). Lacerta does not contain any bright globular clusters or galaxies. 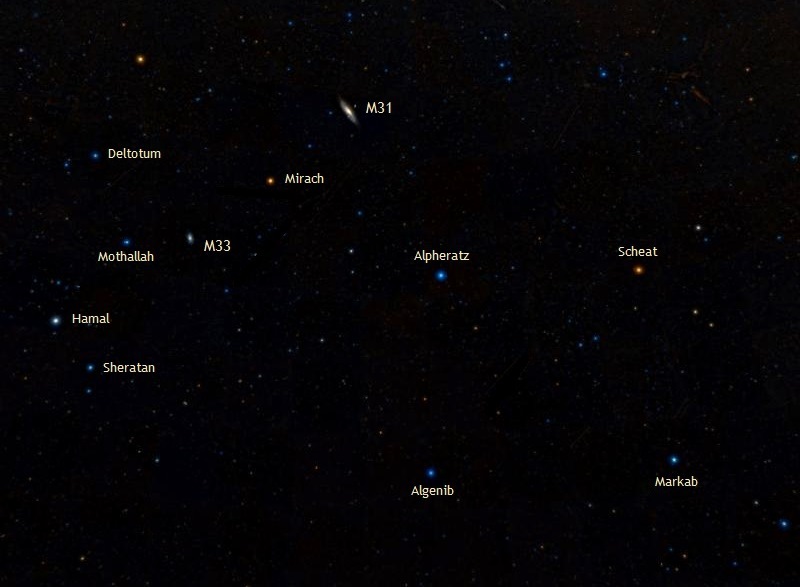 Notable deep sky objects in the constellation include the open cluster NGC 7243 and the planetary nebula IC 5217. 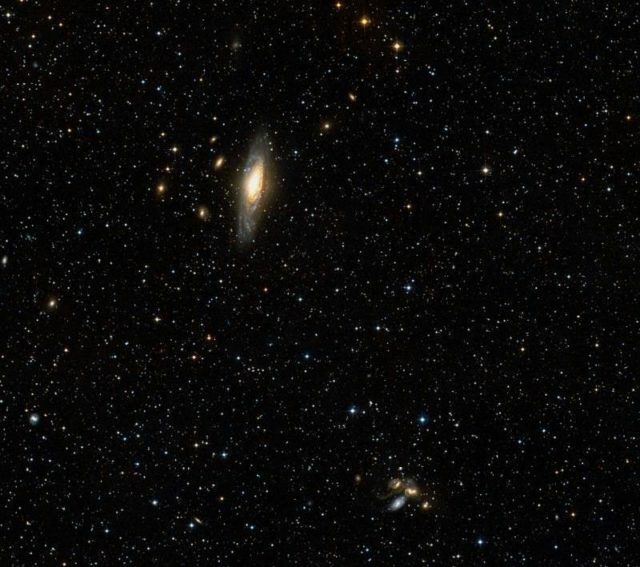 NGC 7243 has a visual magnitude of 6.4 and IC 5217 is much fainter, at magnitude 12.6. Both the cluster and the nebula lie in the vicinity of the stars Alpha Lacertae and 4 Lacertae. Pegasus is the easiest of the October constellations to identify, with the asterism known as the Great Square of Pegasus dominating the constellation. The Great Square, which represents the main body of the horse, is formed by the bright stars Scheat (Beta Pegasi), Markab (Alpha Pegasi) and Algenib (Gamma Pegasi), the 2nd, 3rd and 4th brightest stars in the constellation, and Alpheratz (Alpha Andromedae), the brightest star in the neighbouring constellation Andromeda. Pegasus is the 7th largest constellation in the sky, occupying an area of 1121 square degrees. It is prominent in the northern sky throughout the summer months. 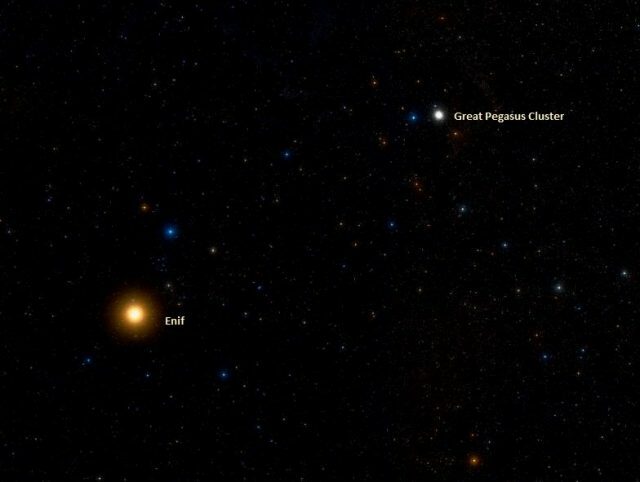 The brightest star in the constellation is Enif (Epsilon Pegasi), and evolved orange supergiant with an apparent magnitude of 2.39. The star marks the horse’s muzzle. 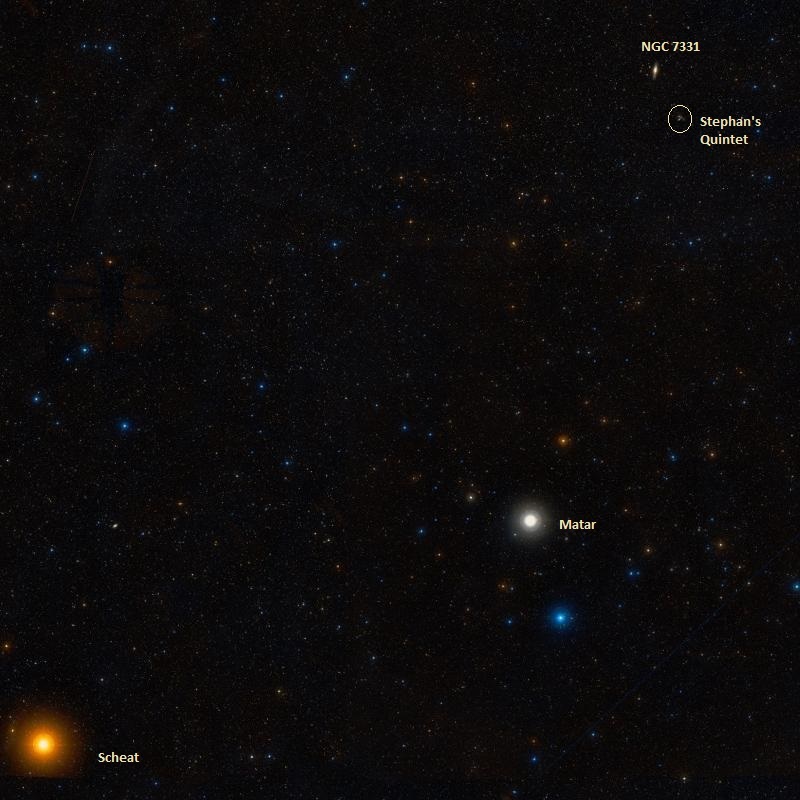 Enif and the stars of the Great Square can be used to find several famous deep sky objects. The globular cluster Messier 15, also known as the Great Pegasus Cluster, is located along an imaginary line drawn from Enif in the direction of the constellation Delphinus. M15 is quite rich and dense. With a visual magnitude of 6.2, it can be seen in binoculars. The Andromeda Galaxy (M31) and Triangulum Galaxy (M33) in the constellations Andromeda and Triangulum are found by following the chain of stars that starts with Alpheratz to Mirach, the middle star in the chain. 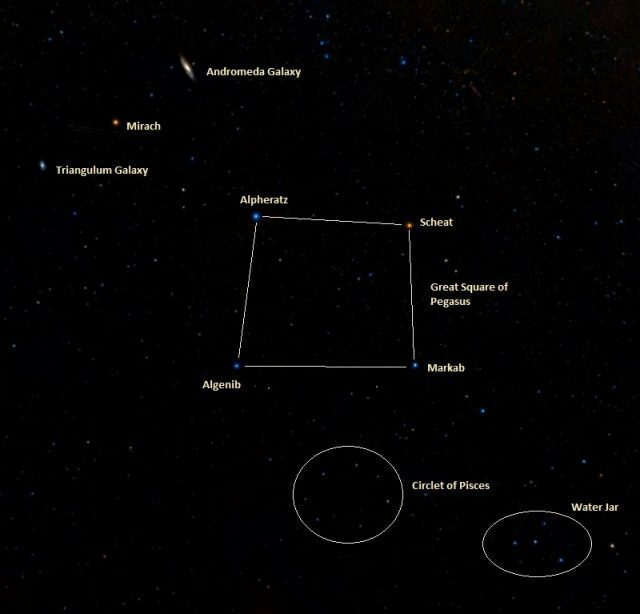 Andromeda is located about 8 degrees to the northwest of Mirach and Triangulum is about 7 degrees to the southwest of the star. The bright, large spiral galaxy NGC 7331, the brightest member of the NGC 7331 Group, and the stunning grouping of four interacting galaxies and a visual companion known as Stephan’s Quintet can be found by star-hopping from Enif to Matar (Eta Pegasi). NGC 7331 is about 4 degrees to the north and a little west of Matar and Stephan’s Quintet is only half a degree to the southwest of the galaxy. South of Pegasus, the zodiac constellation Aquarius is recognizable for its distinctive pattern of stars known as the Water Jar. The asterism is formed by the stars Eta, Zeta, Pi and Gamma Aquarii. Aquarius is the 10th largest constellation in the sky with an area of 980 square degrees. 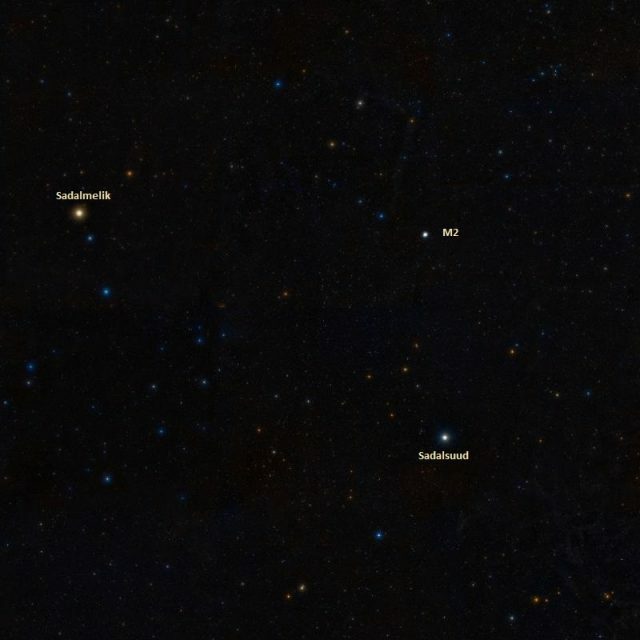 Its brightest stars, Sadalsuud (Beta Aquarii, mag. 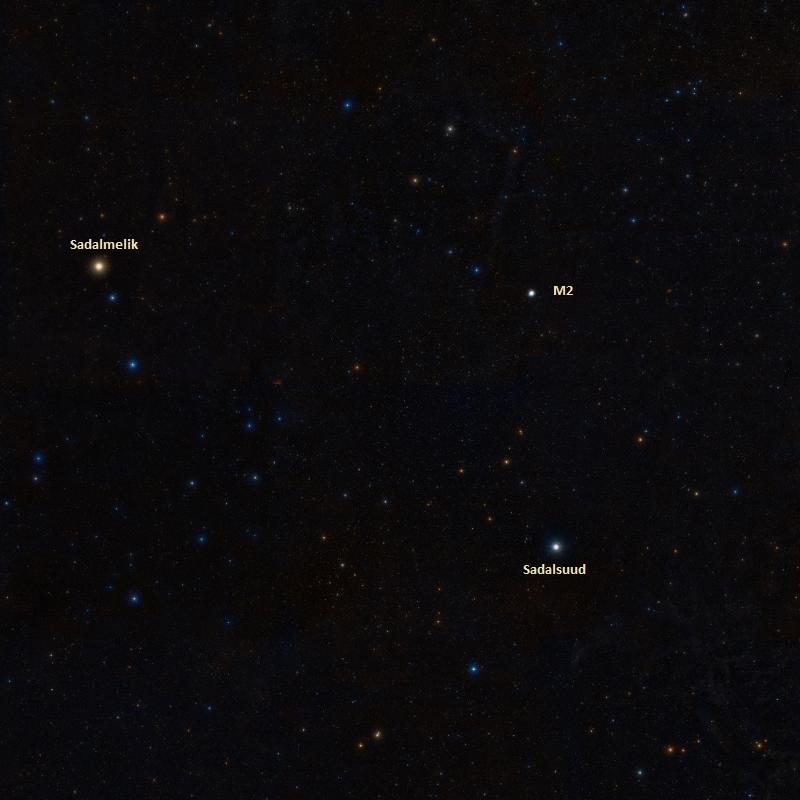 2.87) and Sadalmelik (Alpha Aquarii, mag. 2.94) are both yellow supergiants. The stars make it easy to find Messier 2 as the three objects form a right-angled triangle. Aquarius contains a total of three Messier objects – the globular clusters Messier 2 and Messier 72, and the asterism Messier 73, once thought to be an open cluster – and several other famous objects. These include the planetary nebulae NGC 7293, also known as the Helix Nebula or the Eye of God, and NGC 7009, the Saturn Nebula, and the peculiar galaxies NGC 7727 and NGC 7252, also known as the Atoms for Peace Galaxy. The Helix Nebula is quite bright (mag. 7.6) and large, occupying an area roughly equivalent to one half of the Moon’s diameter. At a distance of 695 light years, it is the closest bright nebula to the Sun. The Saturn Nebula is smaller and fainter, but still relatively bright at magnitude 8.0. The Helix Nebula is located to the southwest of magnitude 3.28 star Delta Aquarii and the Saturn Nebula can be found southeast of Mu Aquarii, a spectroscopic binary system with an apparent magnitude of 4.731. Piscis Austrinus, the Southern Fish, is relatively faint and small. The constellation’s brightest star, Fomalhaut (Alpha Piscis Austrini), is a white main sequence star only 25.13 light years distant from Earth. With a visual magnitude of 1.16, it is the 18th brightest star in the sky. It is the only star in Piscis Austrinus brighter than fourth magnitude. The constellation contains several notable deep sky objects. 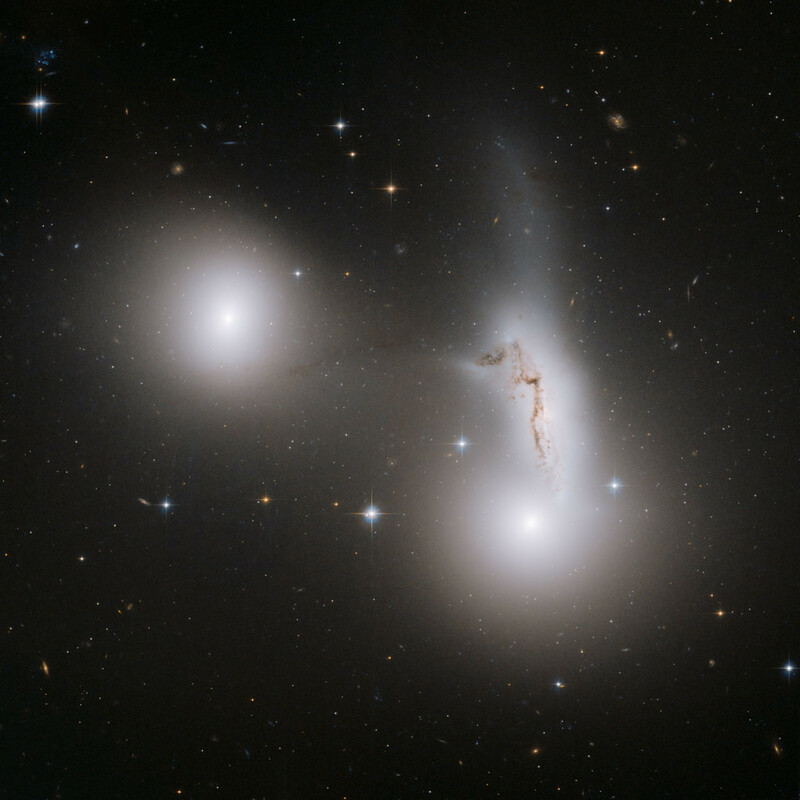 These include the Hickson Compact Group 90, a group of three interacting galaxies – NGC 7173, NGC 7174 and NGC 7176 – that will eventually merge into one, and the spiral galaxies NGC 7314, NGC 7259 and NGC 7172. Grus represents the crane and is one of the constellations known as the “Southern Birds.” The other constellations in this group are Phoenix, Pavo and Tucana. The brightest star in Grus is Alnair, Alpha Gruis, is a class B main sequence star with an apparent magnitude of 1.74. It is the 31st brightest star in the sky. Grus is home to the Grus Quartet, a group of four interacting galaxies, the barred spiral galaxy NGC 7424, the lenticular galaxy NGC 7213, the giant elliptical galaxy IC 1459, and the planetary nebula IC 5148, a magnitude 16.5 planetary nebula with also known as the Spare Tyre Nebula. Octans, the southernmost of the October constellations, is completely invisible to northern observers. It contains the southern pole star, Polaris Australis. The star, Sigma Octantis, is a white giant classified as a Delta Scuti variable. However, in spite of being the closest visible star to the pole, with a visual magnitude of 5.47, Sigma Octantis is barely visible to the naked eye even in the best of conditions, which is why it is not used in navigation. (For comparison, Polaris, the North Star, has an apparent magnitude of 1.98.) It is easier to use the bright stars of the Southern Cross to determine the position of the south celestial pole. Octans is one of the smaller constellations, 50th in size, with an area of 291 square degrees. Its brightest star is Nu Octantis, an orange giant with an apparent magnitude of 3.76. The constellation does not contain many notable deep sky objects. It is home to the barred spiral galaxies NGC 7095 (mag. 12.23) and NGC 7098 (mag. 11.3). NGC 7095 lies about 115 million light years away and NGC 7098 is 95 million light years distant.